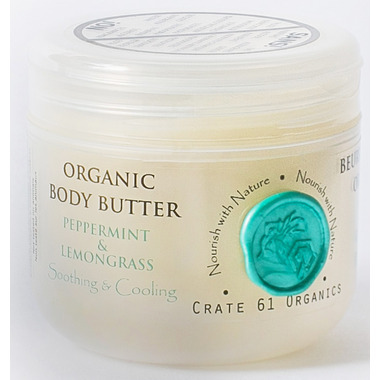 Crate 61 Organics Peppermint Lemongrass Body Butter has essential oil of peppermint that will stimulate your nerves and trick your body into thinking you're cooler than you are. 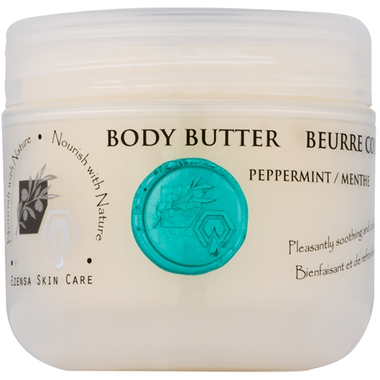 This body butter is perfect for massaging into aching muscles and joints. Rub it into your feet before putting your socks on and your feet will love you! I purchased this product because of its claim to "stimulate your nerves and trick your body into thinking you're cooler than you are. " Did not happen. Also, the lemongrass fragrance is very powerful and gives me a slight headache. If you purchase this product, the one good thing is that you only need a tiny bit and the feel is that of butter....too much and you will feel greasy. I am disappointed in this product. I bought it because of this claim "peppermint that will stimulate your nerves." The only experience is that of the exceptionally potent smell of lemongrass. If you like that scent, you will love this. As the other reviewer stated, it is not a cream but is more like spreading butter on your hands. But if you are looking for the pepperminty coolness, I doubt you will experience that. I bought this product with grapefruit scent the first time and thought I would try the same product but different scent. I enjoy the scent although strong. I am not sure if everyone would enjoy it though. I find the natural products work so much better for keeping my hands moisturized as I work in Health Care and am always washing my hands. A little goes a long way and if you are expecting a lotion, this is not for you. This truly feels like you are putting butter on your skin but feels great!